The Festival opened on 11 May in St John’s, Smith Square with At the World’s Courts given by Le Poème Harmonique and Vincent Dumestre. They explored the influence of exoticism and the East on French music, interspersing works evoking Turkey, Arabia, China, Cambodia and the West Indies with extracts from Lully’s Le Bourgeois Gentilhomme and pieces by Amiot, Cavalli, and Moulinié. From the very start, it was clear that we were in French aural territory with the distinctive sound world of French Baroque orchestration and vocal style in Lully’s opening Chæur des Quatre Parties du Monde from his Ballet de l’impatience. The delightfully raspy bassoon, combined with recorders and oboe became a distinctive feature of the orchestral sound, played brilliantly by Elsa Frank (oboe, recorders), Isaure Lavergne (recorders, bassoon, oboe) Jérémie Papasergio (bassoon, recorders). Music from the time of the Sun King’s predecessors Henry IV and Louise XIII came with two fascinating pieces from Charles Tessier’s 16th-century Chansons turquesques. The first of these was a promotional ditty to ‘My dear ladies’ that concluded with the modest promise that ‘All night long / I can bang like a ram!’ Both pieces included wonderfully exotic orchestrations, the later including percussionist Mael Guezel humming into a bell and then dipping it into a bowl of water. In the later scenes from Lully’s Cadmus et Hermione, he produced an extraordinary sound by singing into a drainpipe. The most notable of the four singers were soprano Claire Lefilliâtre and bass Geoffrey Buffière. Violinist Fiona Emilie Poupard also made significant contributions to an excellent concert, modestly conducted from a sitting position by Vincent Dumestre. The concert was recorded by BBC Radio 3 for broadcast on the Early Music Show on Sunday 20 May at 2pm, and available for 30 days after that via the Radio 3 website. Saturday’s evening events started with the festival talk given by Graham Sadler under the title of ‘Fabricating a Cultural Identity: Louis XIV and the music of the Grand Siècle’. His detailed exploration of the importance of music, dance, architecture and the visual arts in the Sun King’s creation of a distinctive French cultural focus concluded with a reference to the contrasting present-day situation in the arts. A clue to the direction that Louis’s artistic endeavours would move in was the opening slide of the image of the 14-year-old Louis XIV dressed as Apollo, the mythical God of the Sun. This was followed by a concert of selections of music from the sumptuous television drama series Versailles, reflecting aspects of life in the Sun King’s Palace. Fuoco E Cenere were amongst those who contributed background music for the steamy series. Their programme included music by Lambert, Lully, Forqueray, Clérambault, Philidor, Marais, Campra and Charpentier. The star of the concert was the young Cypriot soprano, Theodora Raftis, her rich, focused and unforced voice coping well with the intricate ornaments so typical of French Baroque music. Her principal contribution was André Campra’s Cantata Didon, telling the story of Dido of Carthage and the departure of Aeneas. In several pieces, she was joined by Patricia Lavail playing recorders. The continuo accompaniment was provided by harpsichord, theorbo, and viola da gamba. Although it is not unusual for leaders of music groups to want the focus to be on their own playing, on this occasion this led to the viola da gamba frequently dominating. As well as being far too loud, Jay Bernfeld added random rhythmic accents and suffered from unstable intonation when playing above the frets. His interpretation of Marais’ Les Folies d’Espagne was mannered to the point of being self-indulgent, the playing tending to be either laboured or frenetic. My concerns over the performance issues of the earlier concert were instantly dispelled as soon as Le Concert de l’Hostel-Dieu started playing. With an excellent viola da gamba player (Nolwenn Le Guern), a commendably discrete director (Franck-Emmanuel Comte) and an imaginatively conceived programme, this concert ticked all the boxes. 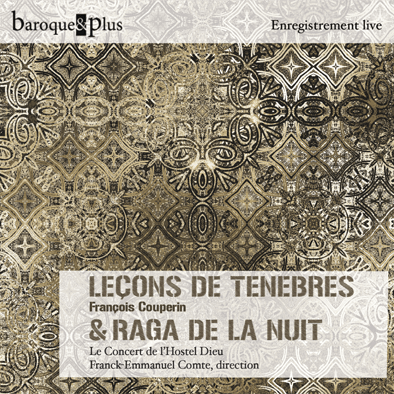 Alternating each of the three parts of François Couperin’s Leçons de Ténèbres with South Indian midnight Râgas, the vastly different musical worlds soon beginning to merge, literally so at the end when the final Râga segued into what initially sounded like a collective improvisation, but turned out to be a composition by flautist Patrick Rudant, the instigator of the Paris-Madras project together with director Franck-Emmanuel Comte. To an underlay of gently phase-shifting drones, each of the four Râgas slowly evolved and built in intensity. Each featured one of the principal soloists: Ravi Prasad, voice, Patrick Rudant, bansuri flutes, and Soumik Datta, playing a wonderfully twangy sarod. The Couperin pieces were sung by sopranos Marie-Frédérique Girod and Violaine Le Chenadec, the former having a particularly attractive vocal tone and sense of period style. The continuo group of Nolwenn Le Gern, viola da gamba, Étienne Galletier, theorbo, and Franck-Emmanuel Comte, organ, played with outstanding sensitivity. Le Concert de l’Hostel-Dieu have produced a CD of an earlier live concert of this combination of pieces (for more information, see here). Earlier in the day Patrick Rudant and Franck-Emmanuel Comte ran a workshop exploring the world of flute and the bansuri, concluding with a collective improvised Râga. Although not part of the festival, Westminster Abbey, one of the partner venues to the festival, is devoting three of its regular short Sunday evening organ recitals to the French Baroque repertoire. Nicolas de Grigny’s 1699 Premier Livre d’Orgue (his only surviving composition) is the highest achievement of the French Baroque organ repertoire, surpassing in his emotional and harmonic intensity Couperin’s better-known and possibly more approachable 1690 Pieces d’orgue. Unusually, this performance of the Gloria of the alternatim Organ Mass setting included the interspersed chant sections, sung by four Abbey lay vicars. The nine organ verses reflect the typically detailed registration indications. But, although vast with well over 100 speaking stops, the Abbey organ (specification here) is far from the obvious organ to interpret the distinctive French Baroque repertoire. It is to David Ponsford’s credit that he managed to find registrations that represented the immense power, if not always the distinctive character, flair, panache, of the French Baroque organ. After the chanted Gloria intonation, the organ thundered out the chant theme on pedal reeds, powerfully penetrating the sound of the full principal chorus. The Gloria includes one of the most beautiful pieces of the entire Baroque repertoire, the Récit de tierce en taille. This Gloria section of the Mass alone lasts around half an hour, giving an indication of the grandeur of the grand Masses of the period. The next two recitals in the series are on 20th and 27th May at 5.45. In contrast, Rameau’s Dardanus Suite (composed some years after Couperin’s death) drew together instrumental movements from his fifth opera. It demonstrated the full grandeur of the French Baroque orchestra including the contrast between the string and the woodwind group. The well-known Chaconne, with the distinctive French refrain structure, was particularly impressive. These two works are an excellent introduction to French Baroque performing style, and the OAE and RAM students will have learnt a lot from rehearsing and performing them under the sensitive and supportive direction of Margaret Faultless. They showed a real understanding of the complex performance style of the period, notably the distinctive gently lilting rhythms. There were very few solo moments, but Rosie Bowker and Amelia Shakespeare (flutes and piccolos), and Minori Saji and Bethan White (oboes) deserve a special mention. One of the annual flagship events of the festival has traditionally been the concert in Westminster Abbey. This year’s compared the French-inspired music of Henry Purcell (organist of the Abbey from 1679-1695, and buried just behind the performers) and Marc-Antoine Charpentier. The evening opened and closed with their versions of the Te Deum, one of the most dramatic of all the ancient hymns of praise. Both composers wrote large-scale, multi-sectioned compositions, each making frequent use of word painting and other dramatic interpretations of the text. Purcell uses six solos voices plus the full chorus, notably with two boy trebles representing the Cherubim and Seraphim who ‘continually do cry’. The emotional heart of the piece comes just before the end, with the extended passage ‘Vouchsafe, O Lord, to keep us this day without sin’, sung with such exquisite beauty by countertenor Robin Blaze that it brought tears to my eyes. Purcell’s famous ‘Bell’ anthem Rejoice in the Lord Always, demonstrated Purcell’s imaginative use of orchestral colour and texture, while the following Come ye sons of art, the last of his secular Birthday Odes for Queen Mary, demonstrated his light side, and his sense of humour, notably in the famed ‘Sound the Trumpet’ where two countertenors try to replicate the sound of the trumpets, without actually using them. As Simon Heighes wrote in his programme notes, the line ‘You make the list’ning shores rebound’ would have caused a giggle as the two unused trumpeters were the father and son Matthias and William Shore. Charpentier’s O Deus, O Salvator noster was probably written for a Corpus Christi processional. Like Purcell’s Come ye sons of art it featured countertenor, tenor, and bass soloists. As in so much French Baroque music, sacred or secular, the influence of dance seemed ever-present. No fewer than ten soloists were used for Charpentier’s Te Deum, including four boy choristers, sounding magnificent when singing together. Those who only knew the famous opening Prélude would have been impressed with the drama of the rest of the work, with its distinctive orchestral colour. James O’Donnell directed with his usual elegance, restraint, and sensitivity to the mood and structure of the music. As well as the enormous number of vocal soloists drawn from the Abbey choir, notable instrumental contributions came from Mark Caudle, continuo gamba and cello, Eligio Quinteiro, theorbo, and Gail Hennessy, oboe. I first heard the singer Lucile Richardot during last year’s Ambronay Festival, noting in my review her “warmth and depth . . . of her extraordinarily compelling voice”. For this concert, focused on the music of Lully, Lucile Richardot channelled the Paris Opera singer Marie (or Marthe) le Rochois, who starred in many of Lully’s operas, notably Armide, his last opera. As well as singing extracts from several of le Rochois’ Lully operatic roles, Lucile Richardot also included music by Lully’s father-in-law, Michel Lambert. Lully was a miller’s son from Florence who arrived in Paris aged 14 as Italian teacher to the Duke of Guise’s niece. At 21 he started dancing with the Ballet Royal de la Nuit, where he met the young fellow dancer, Louis XIV. His extraordinary musical career was built on a combination of talent and ruthless ambition, aided by a notoriously bad temper. Despite his Italian background, he developed a distinctive French style of composition that influenced his French successors as well as many other later composers, one being Handel. It was appropriate that this concert took place in Handel’s own church, St George, Hanover Square, just around the corner from his home. Lucile Richardot (pictured below) sang with extraordinary conviction, displaying outstanding musical and acting ability, the latter notably at the start of Lully’s pastiche Je languis nuit et jour’ (Le Bourgeois Gentilhomme). She concluded with the dramatic moment from Act II of Lully’s Armide, Enfin, il est en ma puissance, when Armide’s murderous rage turns to love. She was accompanied by the excellent Mathilde Vialle, bass viol and Thibault Roussel, theorbo, who in turn were channelling le Rochois’ own continuo accompanists, Marin Marais and Robert de Visse. This was music making of the highest order. Music making of the highest order continued into the late night concert, given by Duo Coloquintes. Violinist Alice Julien-Laferrière is another musician I was impressed with in Ambronay, noting in my review her “infectious enthusiasm and evident enjoyment of the music”. On this occasion, she was performing with her Duo Coloquintes partner Mathilde Vialle, who had played viola da gamba in the earlier evening concert. 2018 is the anniversary of the birth of François Couperin, but Duo Coloquintes devoted their late evening concert to François’ uncle, Louis Couperin (c1626-1661), the founder of the famed Parisian dynasty of organist-composers. Cleverly transcribing Couperin keyboard pieces into several suites of pieces, they followed a tradition of such arrangements from the period. Couperin’s played the violin and treble viol, so he would have appreciated this combination. The arrangements worked extremely well, particularly given the exquisite delicacy and sensitivity of the duo’s playing and interpretations. Also included were pieces from a 1666 Parisian manuscript for the two solo instruments, including the oldest known French piece for solo viol. The London Festival of Baroque Music continues until Saturday 19 May, with the concerts arranged by Sébastien Daucé. Unfortunately, a long-standing invitation to review the annual Regensburg Tage Alter Musik meant I had to miss the rest of the festival.